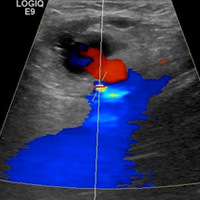 A 65-year-old man with a history of atrial fibrillation and radio-frequency catheter ablation therapy three days prior presents with a painful mass in his left groin at the femoral access site. 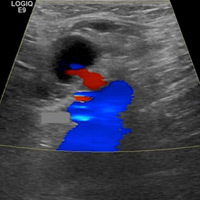 Grayscale images demonstrate a left groin cystic structure (Figure A) demonstrating a yin-yang (red-blue) Doppler ultrasound appearance (Figure B). An arterial structure representing the left common femoral artery is adjacent to the cystic structure (Figure B). 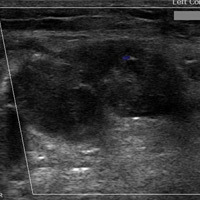 Duplex Doppler ultrasound imaging demonstrates a neck with bidirectional flow extending between the femoral artery and sac (Figure C and D). 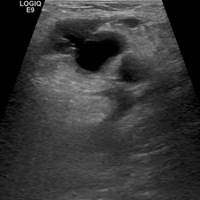 Ultrasound shows thrombosis of the sac after treatment with thrombin (Figure E). Peripheral arterial pseudoaneurysms are one of the most common complications to arise after radiologic or cardiologic catheterization. The incidence of pseudoaneurysm increases when large bore sheaths and postprocedural anticoagulation and/or antiplatelet therapy are used. An arterial pseudoaneurysm is a disruption in the tunica intima and media with adventitial continuity. The clinical presentations include pain, pulsatile mass, groin expansion, anemia, new bruit, and leg weakness. Duplex Doppler ultrasound is the first-line approach for investigating pseudoaneurysms. 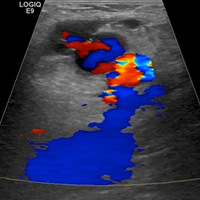 The classic appearance of a pseudoaneurysm is hypoechoic or anechoic structure with to-and-fro (bidirectional) flow on duplex imaging and the yin-yang sign on color Doppler. It is also important to evaluate the pseudoaneurysm neck because short-neck pseudoaneurysms are not as amendable to thrombin treatment. Pseudoaneurysms may undergo spontaneous thrombosis, while symptomatic pseudoaneurysms (intermittent or continuous bleeding) should be treated. Surgery was once the treatment of choice for pseudoaneurysms, but now the preferred treatments are minimally invasive techniques such as ultrasound-guided compression, direct percutaneous management (including ultrasound-guided thrombin injection), and endoluminal management. Ultrasound-guided percutaneous thrombin injection is the treatment of choice for postcatherization pseudoaneurysms. Inactive thrombin is converted to fibrin by thrombin and leads to clot formation. Approximately 0.5 to 1 mL of a concentration of 1,000 IU/mL of thrombin is injected under ultrasound until flow within the sac ceases. — Ikponmwosa Iyamu, MD, is a radiology resident, and Janeiro Okafor is a third-year medical student at the University of Texas Southwestern Medical Center in Dallas. Saad NE, Saad WE, Davies MG, Waldman DL, Fultz PJ, Rubens DJ. Pseudoaneurysms and the role of minimally invasive techniques in their management. Radiographics. 2005;25 Suppl 1:S173-189. Krueger K, Zaehringer M, Strohe D, Stuetzer H, Boecker J, Lackner K. Postcatheterization pseudoaneurysm: results of US-guided percutaneous thrombin injection in 240 patients. Radiology. 2005;236(3):1104-1110. Paulson EK, Sheafor DH, Kliewer MA, et al. Treatment of iatrogenic femoral arterial pseudoaneurysms: comparison of US-guided thrombin injection with compression repair. Radiology. 2000;215(2):403-408. La Perna L, Olin JW, Goines D, Childs MB, Ouriel K. Ultrasound-guided thrombin injection for the treatment of postcatheterization pseudoaneurysms. Circulation. 2000;102(19):2391-2395.